The oldest meaning of pod, for example, is the one that refers to a part of a plant, usually long and thin, that contains the seeds. 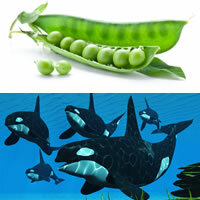 Some vegetable pods can be eaten, such as those of green beans (also called French beans and string beans); others, such as peas, contain the edible part, and are usually not eaten themselves. This meaning itself comes from an Old English word meaning ‘cloak’, so it is possible to see a connection between the two meanings – they both refer to protective coverings. Two more recent meanings of pod were added to the Cambridge Dictionary in its new release online, reflecting their growing use outside the specialist communities that previously used them. In 2008, when the third edition of the Cambridge Advanced Learner’s Dictionary was published, these meanings were not found to be frequent enough to be included in the dictionary. Now they have been popularized by the media and have become part of our (almost) everyday language. The first new meaning refers to a long, narrow container that is attached to an aircraft for carrying engines, weapons, extra fuel, etc. It is also commonly found in contexts referring to space travel and in science fiction. It is possible to see how the meaning of a vegetable pod could have been in the minds of the people who first adapted the word to its new meaning, since it is also a protective container. The second meaning refers to a group of whales or dolphins, together called cetaceans. Such a group is called a pod of whales or a pod of dolphins. This meaning was previously considered specialized and its use confined to scientific writing, but, thanks to TV documentaries such as those presented by the venerable British broadcaster Sir David Attenborough, this meaning is known to more people than ever before, and so it has been added to our general-English dictionary. A well as pod, other words that have acquired new meanings now added to the Cambridge Dictionary include hash (the symbol # on a phone or computer keyboard), intolerant (used to describe a person who is not able to eat a particular type of food), push (to send information over the internet without receiving a request for it first), status (a piece of information that you publish on social media telling people what you are doing, thinking, etc. at a particular time), and zoo (a place where there are a lot of people whose behaviour is not well organized or controlled).